The nRF52840 dongle from Nordic Semiconductor is a small, low-cost USB dongle for Bluetooth® Low Energy, Bluetooth mesh, Thread, ZigBee®, 802.15.4, ANT, and 2.4 GHz proprietary applications using the nRF52840 SoC. The dongle is the perfect target hardware for use with nRF Connect for Desktop as it is low cost but still supports all the short-range wireless standards used with Nordic devices. 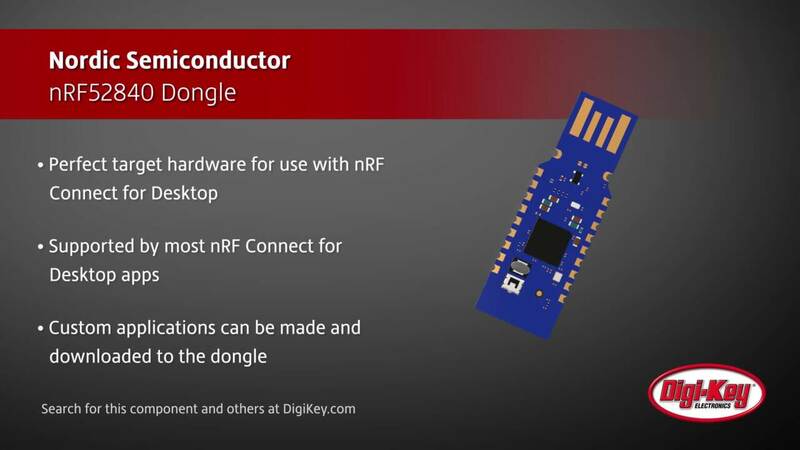 The dongle has been designed to be used as a wireless HW device together with nRF Connect for Desktop. For other use cases, please note that there is no debug support on the dongle, only support for programming the device and communicating through USB. It is supported by most of the nRF Connect for Desktop apps and will automatically be programmed if needed. In addition, custom applications can be made and downloaded to the dongle. It has a user programmable RGB LED, a green LED, a user programmable button as well as 15 GPIO accessible from castellated solder points along the edge. Example applications are available in the nRF5 SDK under the board name PCA10059.